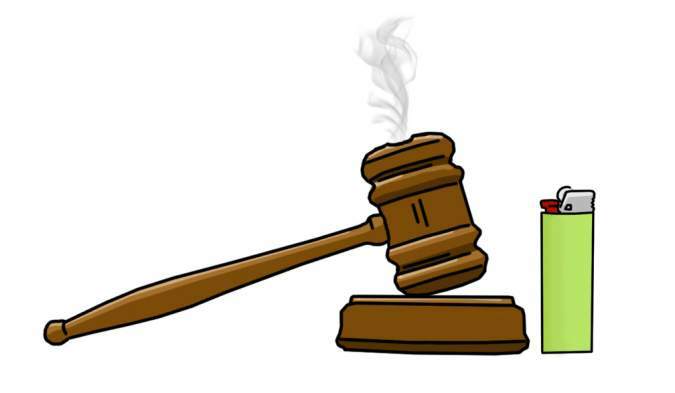 The judicial branch weighs in on employee marijuana rights, drug doggies, and more. Sooner or later, everything winds up in court. You spilled a scalding cup of java on your nads at the McDonald’s drive-through; the insurance company refuses to pay for “water damage”; you’re tired of arsenic in the drinking water; ya feel like suing Costco . . . just because. And now that cannabis is entering the mainstream, it’s time to lawyer up, in this week’s legal round-up. Colorado’s Supreme Court ruled last week that, regardless of the state’s legalization of marijuana, an employer can fire a worker who uses cannabis, even for medical reasons. The case couldn’t have had a more sympathetic poster boy: Brandon Coats, a 34-year-old quadriplegic, was a model employee, but was fired by Dish Network in 2010 after failing a random company drug test. (As if we needed another reason to hate television service providers.) Medical pot has been legal in Colorado since 2000, and Coats had a doctor’s authorization. He never smoked weed at work—nor was he ever under the influence during the day; he used cannabis in the evenings to help with sleep, muscle spasms, and stiffness. Even Dish doesn’t dispute this assertion. Nevertheless, a failed drug test won’t fly in the Zero Tolerance zone, and so, even though his home use was legal and off-duty, the company used their drug policy to terminate Coats. While both medical and recreational marijuana are legal in Colorado, the court agreed unanimously (6-0) with the satellite television company, stating that laws that protect employees from being fired for “lawful activities” hold water only when those activities are legal under bothstate and federal law. Dish officials said they were as pleased as (non-alcoholic) punch with the decision: “As a national employer, Dish remains committed to a drug-free workplace and compliance with federal law.” Obviously, this ruling may waft over to Washington, which, like Colorado, has legalized recreational cannabis and is one of the 23 medical-MJ states. There’s only one solution to all this nonsense: Legalize cannabis at the federal level. As noted in my cover story (“Fear & Loathing in Legal Territory,” Feb. 4, 2015), drug-sniffing canines here in Washington are being retrained for other tasks, as the smell of ganja is no longer a reason for suspicion. While I am not a lawyer by training, I have seen several episodes of Boston Legal (big fan of Bill Shatner’s over-the-top performances), and thus can conjecture. That may not be the correct term. Point is, I can extrapolate. So when I read about the Iowa Supreme Court affirming the right of a gal to be shitfaced drunk on her own porch, I’m seeing a green light for cannabis. In 2013, Patience Paye called the cops on her boyfriend. When officers showed up to investigate for domestic violence, they determined she was the aggressor, asked if she’d been drinking (she had indeed, with over three times the legal limit in her blood), and charged her with public intoxication. Paye’s lawyers appealed her conviction, making a case that her front steps weren’t public at all, and that she should never have been arrested. Patience was patient, and the Supreme Court saw her point, ruling last week that the porch of a private home isn’t considered public, so long as the resident hasn’t invited the general public to be there. It just follows, then, that if ya don’t invite the masses to smoke a fatty on your stoop, ya can’t be charged with public stonification. That’s just logical, man. To make sure that these legal lawsuits and challenges continue to advance the cause, we now have the National Cannabis Bar Association! The goal of the newly formed NCBA is to provide attorneys who are specializing in cannabis a place to get stoned and talk shop. Well, that, and to provide a networking platform to share ideas and strategies for a rapidly changing industry and complex political landscape. The NCBA board comprises legal eagles from six states (including Seattle attorney Mitzi Vaughn of Greenbridge Corporate Counsel). The organization is open not only to practicing attorneys, but to paralegals, law students, and retired lawyers who just want to get their hands on some of the legal chronic. On the advice of legal counsel, we withdraw that last statement. Never thought I’d say this, but there’s almost too much marijuana in the news as of late. With cover stories this month in both Time (by local journalist and former Seattle Weekly scribe Bruce Barcott) and National Geographic (“The New Science of Marijuana”), you can’t walk by a newsstand or go online without getting a contact high. Of course it’s great that mainstream publications are finally treating the subject of cannabis in a more mature manner, rather than continuing to deliver cliched jokes about smokescreens and . . . contact highs. Still, I wish Time and Nat. Geo had saved some for later. Like good ganja, ya gotta space the hits out. In addition to the weed-news deluge, a plethora of cannabis culture stories make me want to roll things back to the days of Reefer Madness. Take marijuana-infused salmon. Please. 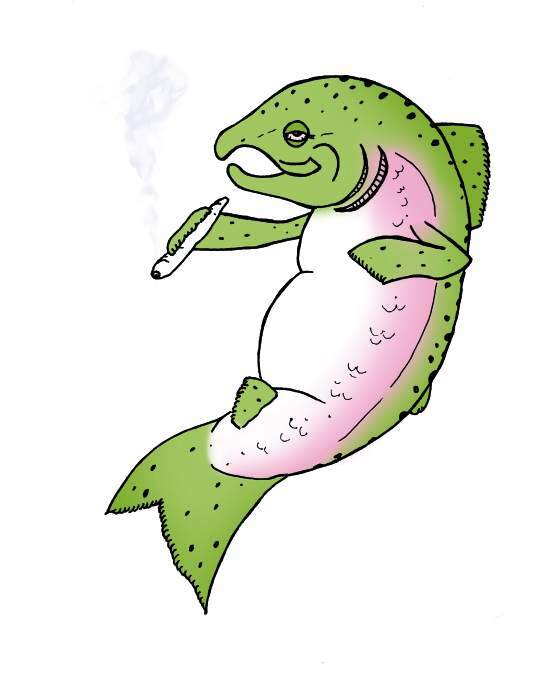 The owner of Rosenberg’s Bagels in Denver created a seriously smoked salmon when he recently infused the fish with cannabis. 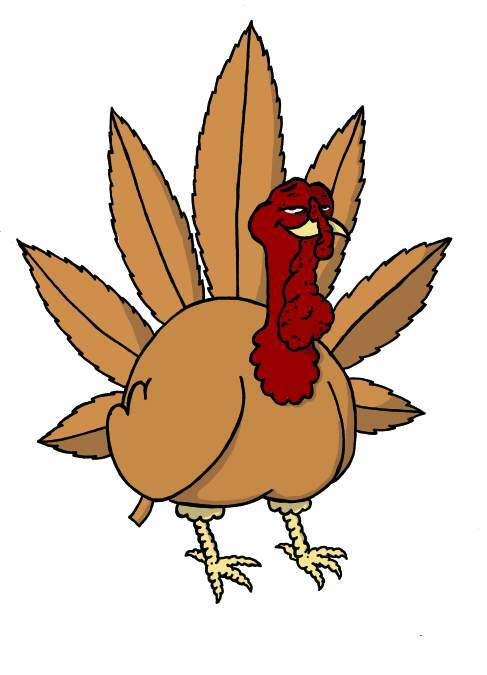 The process involved introducing marijuana into Everclear (which extracts the THC, the psychoactive element in ganja), then spreading the tincture over the fish for 72 hours before cold-smoking it (in the traditional way). Point is, not everything has to be infused with cannabis. Yoga classes are being combined with getting high, for example. Not necessary. Your yogic bliss should be enough for mind, body, and soul, so that it doesn’t require taking bong hits during bandhasana. A company introduced cannabis K-cups last week (Catapult coffee pods retail for $10 each), infusing your morning by truly waking and baking. How ’bout ya don’t!? Moderation, people. Even with bumps in the rasta road, surveys from Public Policy Polling show that in the two states that legalized cannabis, the people like the law—even more than when they voted it in. Fifty-six percent of us here in Washington approve of the recreational weed law, and 37 percent dislike it. In the 2012 referendum, the same percentage of folks approved, but 44 percent voted against the intiative. Better still, 77 percent of voters say the new laws have either had a positive effect or no effect at all. In Colorado, a different poll confirmed the trend. Sixty-two percent of voters there support the new ganja laws, an increase of seven percentage points from the vote tally in 2012. Survey says: It’s all good.